This thread is really exciting!!! Thanks Nocturnal Egyptian! agreed, indigo. i bought some HHGs a few years back after having read about reich's work, and have just had them collecting dust under beds ever since, on the basis that it couldn't hurt, at least. silly of me not to have thought about this sprouting way of testing them, specially as i'd seen those pics of plants going "yaaaay!" when next to the stuff before. he has fine powder ones too. I've been drilling some scrap aluminum and copper, but after burning through a few drill bits, ebay is more economical. I'm going to try some locksmiths for key shavings. I also put doubled up aluminum foil through a crosscut paper shredder, lots of surface area but not much mass. Seems consensus is that 50/50 resin/metal mix is good, but I'm not clear if that is volume or weight, which would make a huge difference. I also learned that you can thin out bondo body filler with the more liquid-y fiberglass resin so it will pour, I just used the bondo cream hardener on it alone. But I wanted to try a few with some bondo I had around before putting any more $ into it. tried again with 30.0g of dry mung beans. after approx. 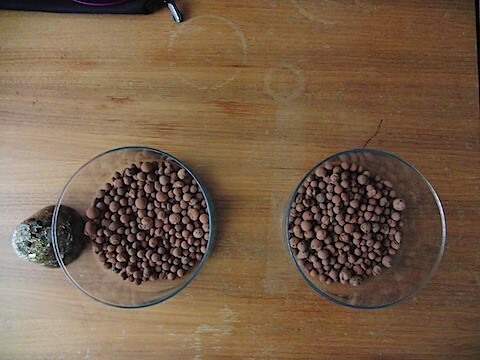 60 hours, the seed without orgonite weighed 79.7g, while that with orgonite weighed 95.8g, approx. 20% more. you can see the difference in the volume in the pics below. conclusion, this stuff does actually work, so i'm going to start making it now for use with growing plants, and to spread around mobile towers locally. thanks nocturnal for re-igniting my interest in the good dr. reich. Appreciate the bump! Somehow I missed this thread....more research! Stupid question? Is this in any way related to the Power Core bracelets I see people wearing? Those power-balance bracelets people wear, I haven't done any testing on them, zip, nada, zero, but I know the theory behind them. The theory is that holograms can hold a vibration, much like a crystal. So they input an allegedly beneficial frequency into the little hologram on the bracelet, and then by being in close contact with it all the time, your body slowly "normalizes" to that frequency. I see people wearing them, and I always make it a point to ask if they help at all. Most people say "kinda" and I haven't gotten any negative responses about them yet, but I also haven't heard any RAVE reviews about it changing lives...I also haven't seen any meditators or yoga practitioners wearing them. 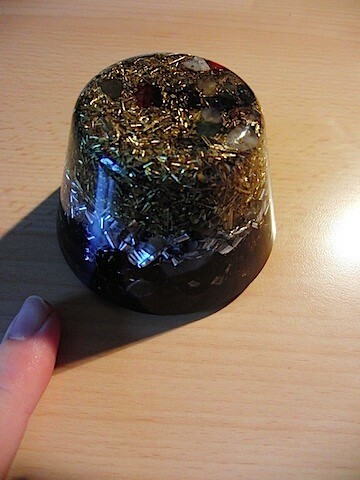 What I like about orgonite is you can get the same results but you can make it yourself. The experiment to test this basically consists of two glass bowls filled with porous stones that can absorb and hold water. 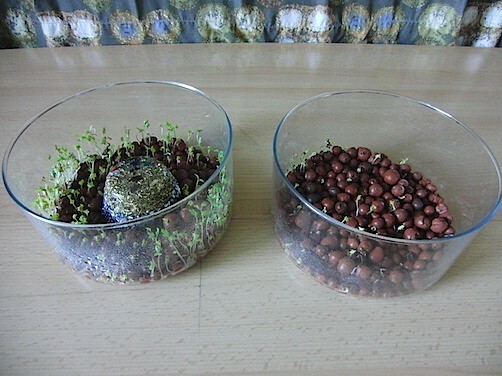 As plants I used ordinary garden cress seeds. Each bowl contains approximately 100 of them. 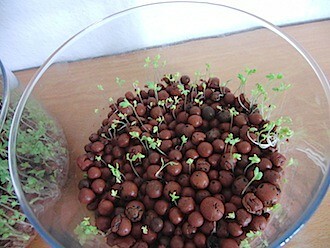 I sprayed them with ordinary tab water to start the germination. 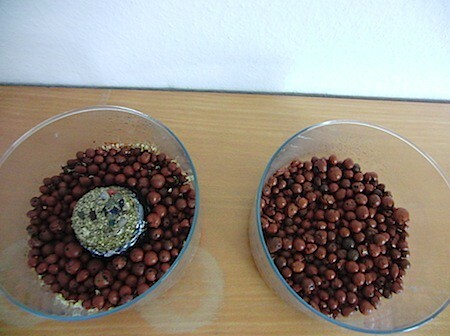 Assembly of the experiment: orgonite block, two glass bowls filled with water holding stones and cress seeds. Used materials: (aluminium, brass, resin, quartz, rose quartz, some other minerals). The block is a solid compound and does not contain any nutrients that could be utilized by the sprouts. The seeds in the Orgonite bowl have already begun to sprout. The difference is quite drastic. Keep in mind that the Orgonite block is made from resin and metal. It does not contain any substance that could have acted as a chemical fertilizer of some sort. 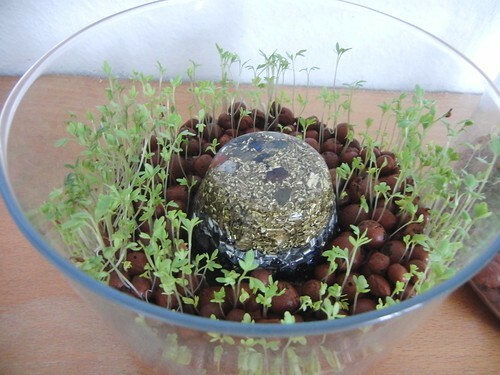 The bowl without the Orgonite only produced poor looking sprouts and only a small percentage of the seeds grew at all. The Orgonite sprouts look better, taste better and have grown taller as well as quicker than the sprouts in the control group. The effect is obvious and drastic. The question that remains is how is it possible. My personal theory is that plants do not only live from sunlight, water and minerals but that there are other forms of energy as well which can be utilized by them. Orgonite might be a source of such a form of energy. Consequently plants that grow in proximity to Orgonite will grow faster and have increased vitality. Orgonite might also be beneficial for the human bio-system, but that demands more experiments to be done. Power Balance bracelets, touted by sports luminaries such as Shaquille O’Neal for how they improve strength and flexibility, have been exposed as being nothing more than a rubber bracelet, writes The Associated Press (AP). According to Australian officials, Power Balance, which is located in California, should not be advertising the bracelets as being able to offer increased power, and other claims, said the AP. The firm agreed, saying, “We admit that there is no credible scientific evidence that supports our claims,” said Power Balance, quoted the AP. Power Balance has also agreed to refund its customers. The Australian Competition and Consumer Commission (ACCC) prompted Power Balance to admit its claims are false and to offer refunds to customers who feel they have been cheated, said the Herald Sun. Known customers include Benji Marshall, Cristiano Ronaldo, Brendan Fevola, and Shaquille O’Neal, said the Herald Sun and Lamar Odom, David Beckham, Robert De Niro, Russell Crowe, and Gerard Butler, according to the AP. Power Balance had previously made claims that the product improved balance, strength, and flexibility via its “holographic technology” that would disperse energy throughout the body, said the Herald Sun. Many agreed. “Our trainers swear by it,” Phoenix Suns forward Jared Dudley wrote on his Twitter page, quoted the AP. The bracelets were introduced in 2007 and sell for $29.95 each, said the AP, which noted that Power Balance sold $8,000 its first year and believes that figure will exceed $35 million in for 2010. Power Balance says it relies on testimonials, not science, according to spokesman Adam Selwyn, said the AP. Power Balance pays athletes to use their images wearing the bracelets, it said, wrote the AP. Josh Rodarmel, a Power Balance co-founder, said in a statement “We’re not trying to win over every person in the world,” quoted the AP. “Consumers should be wary of other similar products on the market that make unsubstantiated claims, when they may be no more beneficial than a rubber band,” ACCC head Graeme Samuel said, quoted the Herald Sun. On its web site, Power Balance runs a video footage of athletes who are showing the benefits of the bands by standing with their arms extended while resisting pressure both with and without the bands, said the AP. A Wisconsin professor ran similar tests with 42 athletes wearing the Power Balance wristbands and silicon versions purchased at Wal-Mart; said the AP. The tests revealed no difference between the two products. “I think it is a scam,” said John Porcari, professor of exercise and sport science at University of Wisconsin-La Crosse. “It has absolutely nothing to do with the bracelets. It is all in people’s heads,” quoted the AP. Here's the reason I bring this up...A couple months ago two guys came into the store wearing these bracelets and began a conversation about them, I had never seen them before and then they start their sales pitch, now I'm skeptical as all hell. They ask me if I wanted to take a "test" with them about their virtue, I said ok. I put my arms out horizontally to the sides and he pushed down on them, quite easily and then I put a bracelet on and he did it again, but with much more resistance. The second test involved me putting my arms behind me finger locked together and forced down enough to make me lose my balance drastically. I did it with the bracelet and I couldn't be budged! I'm still skeptical as hell but then again I haven't explored argonite either.